This is an evening birth time for Obama; the 1:06 pm time has become favored by astrologers. just after noon, or 1:06 pm, 7:11 pm, or maybe even 7:24 pm? Articles written earlier by astrologers were using a midday birth, usually 1:06 pm. More recently Obama’s office has released an evening time. One can only speculate on the motives of any candidate to try to control a birth time, but in this era of identity theft it is not impossible that someone might be fool enough to steal his birth data. Also it was traditional in the days of European monarchy to conceal the date and time of a monarch’s birth to keep enemies from having too much information, and knowing the king’s vulnerable times. Mr. Obama also has some reason for embarrassment at the circumstances of his birth. His parents may not have had a legally valid marriage; his father, Barack Obama Sr. was already married to a woman named Kezia in Africa. In fact, he was married to four different women at different times but always wound up going back to Kezia. So while officially it is maintained that Obama’s mother Anna divorced Obama Sr., it could have just as likely been an annulment she obtained, on the grounds of his prior marriage. Obama Sr. seems to have had a bit of trouble absorbing our custom of marriage to just one woman at a time, and seemed to have preferred polygamy. Anyway, I am going to print up a chart using the 7:11 pm birth time (which supposedly came from a campaign worker) and see how it works. We have a date that has not wavered, at least, and we can still derive a lot of info from a thumbnail chart. First the natal planets: Ascendant is 14 degrees Aquarius, Midheaven is 25 degrees Scorpio. Sun is at 12 degrees Leo, accompanied by Mercury at 2 degrees (both in the sixth house of work and health) and Uranus at 25 degrees Leo in the seventh house of public image. Next is Pluto at 7 degrees Virgo, and Mars at 22 degrees Virgo, both in the eighth house. Neptune high at 8 degrees of Scorpio in the ninth house of national politics, Saturn at 25 degrees Capricorn in the twelfth house, Jupiter rising in the first degree of Aquarius (in the 12th house), the Moon at 3 degrees Gemini in the fourth house, Venus at 2 degrees Cancer in the fifth house. Let me say first that in some ways I think this chart is more suited to Barack Obama than the ones with a midday birth time. Those charts have Scorpio rising — their advantage is that this puts the Sun near the top of the chart, but the disadvantage is that they put Saturn and Jupiter at the bottom of the chart and away from key houses. A guy with only a Neptune on the ascendant and a Sun high in the chart is a heck of a salesman but probably would not be interested in politics. But this chart shown here, with an evening birth time, puts Saturn exactly sextile the Midheaven. Saturn coincidentally rules the Democratic Party (Jupiter rules the GOP). Aquarius rising also accounts for his tall slender appearance. Jupiter placed in a Gauquelin zone shows a sunny, uplifting personality, and also gives his interest in law and politics. The ascendant axis is the middle of the fixed signs, or the world axis — persons with such birth charts often wind up in the news. But even if I am wrong totally wrong about the ascendant, the planet placements alone indicate an extraordinary person, someone who gets chosen to lead others. His Moon at 3 degrees of a Mutable sign (Gemini) is at a critical degree, showing that women and being in the public eye would both figure prominently in his life. That Moon is also exactly square Formalhaut, a fixed star that indicates someone who always is selected/chosen/Elected to high station in a life lived in the public eye. Saturn at the 26th degree of a Cardinal sign is another planet at a critical degree, showing that high office and national politics in the Democratic Party would figure largely in his life. Neptune is conjunct another critical degree in Scorpio. And finally the North Node is within orb of the important 29th degree of Leo and another fixed star, the royal Regulus. All in all, this is like the chart of royal prince, no mere product of a broken home. This year, Obama’s progressed Venus makes a conjunction to his natal Uranus, accounting for his sudden charisma and popularity of a rock star. This combination is also perfectly aligned with the U.S. Moon, making him an American favorite — and I might add that this point was activated by the solar eclipse (at 17 degrees Aquarius) of February 6th near Super Tuesday. Whereas we thought at the time that the eclipse was opposing his Sun and Uranus from the bottom of the chart — what if it was really on his Ascendant and triggered the way he suddenly caught fire with the voting public? That would have been a far stronger placement for the eclipse and would have magnified the effects. 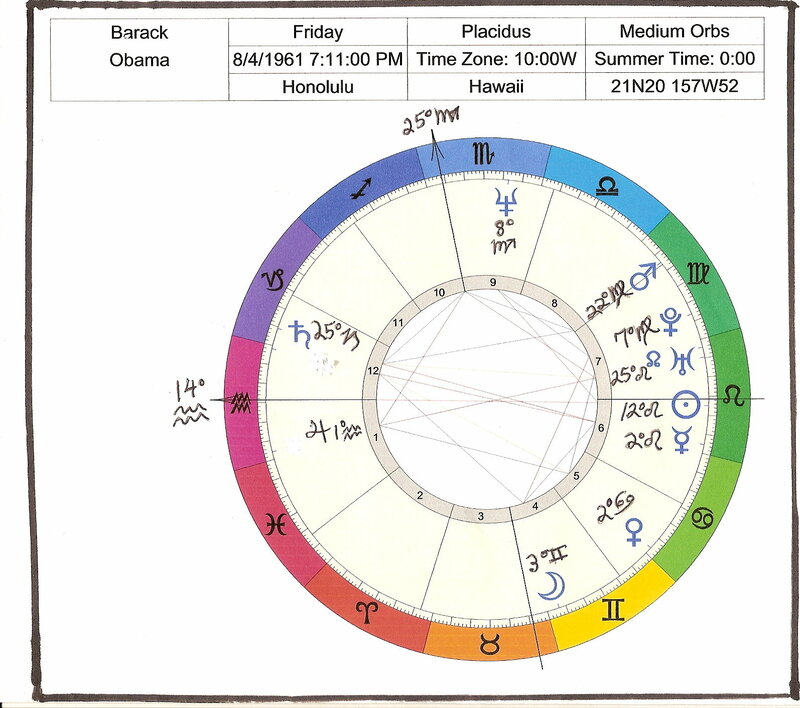 Another astrologer uses the Articles of Confederation chart, in which Obama’s Uranus and North Node are conjunct the U.S. Jupiter — and his natal Neptune is conjunct the U.S. Saturn, plus his progressed Neptune joins the U.S. natal Mercury. One possible interpretation is that the current recession will receive a dose of positive, inspirational talk that should calm the stock market and soothe the national psyche. In addition, his progressed Jupiter at 27 Capricorn 20’ (retrograde) conjoins the U.S. Pluto, and his progressed Moon at 01 Aquarius 46’ conjoins the U.S. progressed Pluto — I interpret this as Obama instituting progressive reforms in the law, and doing all he can to restore the Constitution as written by our Founding Fathers. Another key question is how does his chart tie in the U.S. chart (or charts)? The commonly used Sibley chart has the U.S. Moon at 25 degrees Aquarius — and Obama’s Uranus is directly opposite PLUS his Saturn is semi-sextile that point. Also closely aspecting that Moon is his South Node (nearly conjunct) and his Mars, which is inconjunct. It is worth noting too, that the Saturn-Uranus opposition on election day this November is echoed in his natal inconjunction between those planets. Perhaps he can find a way to reconcile the future and the past, the steady course with the progressive pathfinder, represented by Saturn and Uranus. On election day the Moon changes signs from Virgo, where Obama’s Saturn is placed, to Aquarius, to form a conjunction to Obama’s Jupiter in the first degree of that air sign. This is not a sure thing, because no election is a sure thing — but man oh man, that is sure a powerful imagery, and it repeats the activation of his ascendant that occurred with the Super Tuesday solar eclipse in February 2008. Also Mercury moves from Libra to Scorpio, from sextiling his powerful North Node-conjunct-Formalhaut in Leo, to a trine to his Jupiter in Aquarius. Some astrologers that I respect are troubled by the planets changing signs on election day, and while there could be some disruptions or attempted disruptions — some folks will not be happy at all with a black person in the White House and could try to stir up a riot — But I think that overall the day will end peacefully and optimistically about the future. Obama has shown an ability to calm and uplift the public spirit and I am reasonably confident that he will speak out effectively, with a voice of reason, if anyone attempts to deny the American people their expressed will. Entry filed under: Famous People. Tags: astrology, barack obama, politics, presidential race. My thanks to Gliderbee for pointing out a misstatement in this article. I had written that Jupiter is in the first house. Obviously that is not correct, and that was poor editing on my part. But I have amended the sentence to read: Jupiter placed in a Gauquelin zone shows a sunny, uplifting personality, and also gives his interest in law and politics. Jupiter IS in a powerful Gauquelin zone, and is just one more power point in a powerful natal chart. As for the time, I started writing this when a campaign staffer was quoted as citing a birth time of 7:11 pm; only later did some evidence confirming a 7:24 pm birth time come out, but that does not radically change the birth chart. It matters of course, if you are trying to correct a birth chart to account for the timing of key events in the life of the native, but that was not my intent here.